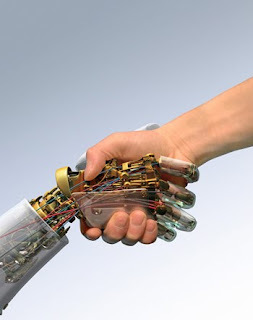 Paper presentations: Robotics Artificial Intelligence ~ Engineering projects ideas for final year students & paper presentations collection blog. Can be used: Paper presentations, study the basics of robots and artificial intelligence. This is a paper presentation on basics of robotics and artificial intelligence. Both robotics and artificial intelligence is a booming topic in today's context. As science is developing in such a pace these technologies are holding the spotlight. all the young budding engineering students are also found to have big interest in these topics. So this paper presentation will be helpful for all those who are planning to start there robotics study. This paper will cover some basic topics of robots too. Until now we only discussed the localization of a single object, but often one seeks to localize many objects. The classical example of this problem is robotic mapping.In the localization algorithms before we assumed that the robot knew the map of the environment a priori. But what if it does not? Then it has to generate such a map itself. Humans have already proven their mapping skills with maps of the whole planet. Now we will give a short introduction how robots can do the same. This problem is often referred to as simultaneous localization and mapping (SLAM). The robot does not only construct a map, but it must do this without knowing where it is. A problem is that the robot may not know in advance how large the map is going to be. sensing models and requires that the landmarks are distinguishable. Think of a map where you have several distinguishable landmarks of unknown location. The robot now starts to move and discovers more and more landmarks. The uncertainty about the location of the landmarks and itself increases with time.When the robot finds one landmark he already discovered earlier again the uncertainty of its position and of all landmarks decreases.